In 2016, at the International Society for Systems Sciences annual conference, I was awarded the “Sir Geoffrey Vickers Memorial Award” for a paper I wrote titled “Bringing Forth the Ecological Economy”. A revised section of that paper is now published here titled “Exploring Foundations and Value Boundaries in Social-Ecological Systems”. The work of Sir Geoffrey Vickers is inspiring to me, now more than previously. Born in 1894, Vickers served in both World War I and II being awarded for his service as Colonel and Deputy Director General at the Ministry of Economic Warfare in World War II. I mention this partially because it is an experience which I have no relation with and some times I like to reflect on how soft we have become. Vickers would go on to accomplish much more as a lawyer, administrator, writer, and pioneer in systems science. 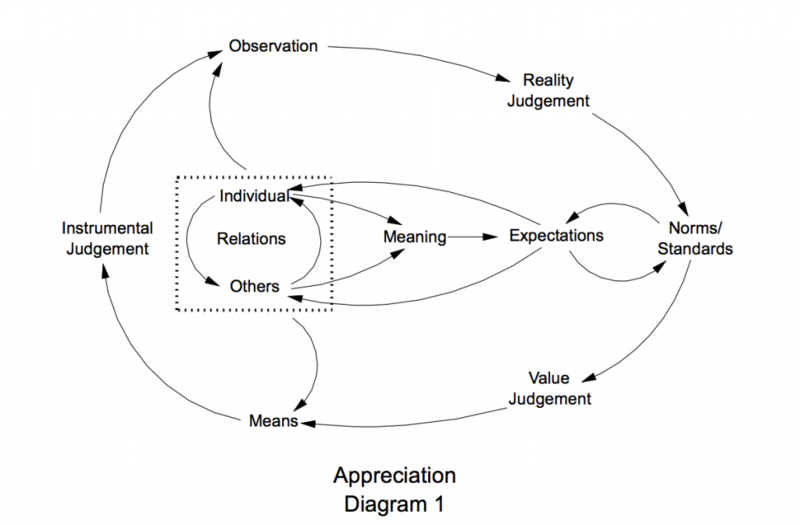 Vickers would develop the notion of ‘Appreciative Systems’. This lens, this equilibrium, this fixed point, this distinction, can be appreciated in terms of our appreciative setting; that which allows us to create meaning of our environment. In the understanding of Vickers, a system “codes” its environment according to it’s “Appreciative setting”, so as to maintain particular relationships and buffer against others. The word appreciate lends us an ambiguity: on the one hand connoting value and on the other a grasping. It is this notion of appreciation, with its ambiguity which sits at the core of ethical design, as well as marketing. To appreciate all that goes into making something which it was not, begets an invitation. That invitation is to expand our conception of that ‘something it was’, into something far greater, something which has inspired us to modify its form. Here we find a continuity or a relationship between a beginning and an end, an input and an input, in which we are participating.